When Byron Mason’s estranged nephew, Philip, rings him out of the blue in desperate need of help, he knows he must put his personal feelings aside to protect his family. A teenage boy has been murdered, and Philip is one of the suspects. Worse than that, the dead boy was the nephew of Ritchie McLaughlin – a local thug who Byron has clashed with in the past – and Philip has now gone missing. Desperate to clear Philip’s name, Byron enlists the help of his old friend Adam Sterling to track down the real killers. Is Philip in danger? Can Byron and Adam find him before the police do? Or has Byron’s violent past with McLaughlin come back to haunt him…? 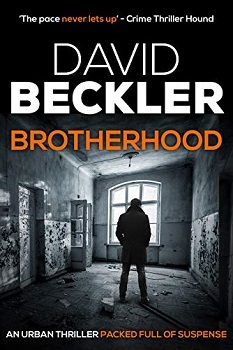 David Becker’s novel Brotherhood starts with an italicized prologue introducing “The Boy” whose village is attacked and he is captured. Each chapter starts out with an italicized continuation of the prologue story of the “The Boy” becoming a twelve-year-old soldier before the current story starts and continues. I found this a bit annoying at first. But when I finally figured out that the story of “The Boy” was a back story on the novel’s primary antagonist named Mugisa—a.k.a. Mathew Walcott, I found the technique a uniquely clever way to explain Mugisa’s bad character flaws. The story starts in Manchester, England with Mugisa and his teenage gang killing a gang member, Liam, perhaps accidentally, for stealing from the gang. Liam happens to be the nephew of Ritchey McLaughlin, the most notorious gangster in the area, who plans to avenge his death. One of the teenagers, Phillip Mason, who is peripherally involved in Liam’s death, seeks the help of his uncle, Byron Mason, who becomes the main protagonist in the story. Byron has a major beef with Ritchey McLaughlin that started during their childhood encounters, and Byron steps in to defend his nephew by hiding him from the gangster and trying to solve the murder. When Liam’s body is found, Siobhan Quinn heads up city’s investigation team. Siobhan is a newcomer to the police department. She was recently brought in from out of town as the chief inspector and becomes the second protagonist trying to solve the murder. I thoroughly enjoyed this novel’s storyline, character development, and dialogue. The story was captivating throughout, easy to follow, and easy to read. I did have problems with editing errors, but learned that the copy I read was a proof copy, so it has gone through another edit before going on sale. I would highly recommend this novel to young adult and adult readers, and I give it a four star rating. I spent my first eight years living on an agricultural college in rural Ethiopia, where my love of reading developed. After dropping out of university I became a firefighter and later a businessman. I began writing in 2010, working on my first novel in my spare time, a crime thriller called Brotherhood. I like writing about protagonists with a strong moral code who don’t fit in with conventional society. I also enjoy writing about baddies and how they arrived at their fallen state. When not writing I try to keep fit, socialise and feed my voracious book habit. This sounds innovative and intriguing – excellent review! It really is, thanks you. Sounds cool but not sure if the editing errors would drive me nuts or not. It is one the fence for me I think. The editing has been sorted now, just the copy we had was a proof copy. Thank you. It is so interesting.